Michael studied at the Guildhall School of Music and Drama, the Royal College of Music Opera School and the National Opera Studio. He began his studies with Eduardo Asquez, with Elio Battaglia at the European Opera Centre then continued with Norman Bailey at the Royal College of Music Opera School. Michael began his career at the English National Opera in 1990 who supported him through the National Opera Studio. 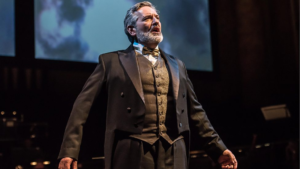 He studied with Sir John Tomlinson for his debut as Wotan in Opera North’s DAS RHEINGOLD. Druiett’s performances as Wotan received critical acclaim in the National Press. For The Daily Telegraph, Michael ‘made an authoritative Wotan.’ The Spectator wrote, ‘Michael Druiett, the commanding Wotan with a remarkably Wagnerian profile, not only has a sumptuous voice, but also uses it to express both Wagner’s grandeur of aspiration.’ Michael continued within the company to sing Der Wanderer SIEGFRIED, of which The Financial Times wrote, ‘Michael Druiett has matured into a majestic Wanderer of international quality’ and the Sunday Times concluded, ‘Michael Druiett’s Wanderer marks another bold step into the demanding repertoire. He has the physique du role and the vocal power to match.’ Michael recently returned to perform the role of Wotan and Der Wanderer DER RING DES NIBELUNGEN with Opera North. These performances were aired on the radio and was televised on BBC4. This can also now be viewed on the online BBC Arts Channel. Druiett’s career began as a company member and principal bass English National Opera and Royal Opera House Covent Garden, leading to performances as a guest at Glyndebourne Festival Opera, Scottish Opera, La Monnaie Brussels, L’Opera National de Paris, L’Opéra National de Lyon, L’Opéra National de Montpellier, New Israeli Opera and the L’Opéra National Bordeaux. Recent and future engagements include Inspector and Uncle Albert in Philip Glass’ THE TRIAL with Scottish Opera, Le Père LOUISE with the Buxton Festival Opera, Pater Profundus Mahler Symphony No.8 at the Leeds International Concert Season, Peter The Apostles with the Philharmonia Orchestra at Gloucester Cathedral, The Bells with the Royal Philharmonic Orchestra at London’s Barbican, Beethoven Symphony No 9 with the Xian Symphony Orchestra (China) and Hobson PETER GRIMES with Opéra de Monte-Carlo. Other previous engagements include Ivan Khovansky Khovanschina Jokanaan Salome Monterone Rigoletto Amonasro Aida with Welsh National Opera, Budd Albert Herring, Lodovico Otello, Hobson Peter Grimes and Sprecher Die Zauberflote with Glyndebourne Festival Opera, Mr Redburn Billy Budd with Deutsche Oper am Rhein and L’Opera National de Paris. Amonasro Aida with Dorset Opera Festival, Monterone Rigoletto for Royal Opera House Covent Garden and Donner Das Rheingold for Scottish Opera, Mr Redburn Billy Budd, Sharpless Madama Butterfly and Baron Douphol La Traviata for Opéra National de Paris, Lord Berkly and Lord Davenaut Der Vampyr Everyman Theatre Cork, Misha The Bartered Bride and Angelotti Tosca for Opéra National de Paris and Opéra National de Montpellier, Il Commendatore Don Giovanni Deutsche Oper am Rhein, Glyndebourne Festival, Glyndebourne Touring Opera and Opera North, The Bonze Madam Butterfly for Glyndebourne On Tour, Welsh National Opera, Opera de Lyon and Raymond Gubbay for the Royal Albert Hall. Concert Engagements include Beethoven Symphony No. 9, Berlioz La Damnation de Faust and L’Enfance du Christ, Brahms German Requiem, Peter The Apostles, The Dream of Gerontius Faure Requiem, Handel Messiah, Mahler Symphony No. 8, Mendelssohn Elijah, Mozart Requiem, Rachmaninov The Bells and Verdi Requiem. Druiett has worked with many of the world’s leading orchestras including the BBC Philharmonic, Bournemouth Symphony Orchestra, English Chamber Orchestra, Philharmonia Orchestra, London Philharmonic Orchestra, London Symphony Orchestra, Royal Northern Sinfonia, English Northern Philharmonic, Royal Liverpool Philharmonic, Royal Stockholm Philharmonic Orchestra and Orchestra de Paris. He has worked with many of the world’s leading conductors including Richard Armstrong, Kees Bakels, Daniel Barenboim, Sir Colin Davis, Stéphane Denève, Sir Edward Downes, Sir Mark Elder, Richard Farnes, Valery Gergiev, Sir Bernard Haitink, Vladimir Jurowski, Lothar Koenigs, Louis Langrée, Nicolai Luisotti, Sir Charles Mackerras, Gianandrea Noseda, Sir Antonio Pappano, Libor Pešek, Tobias Ringberg, Carlo Rizzi, Mstislav Rostropovitch, Gennady Rozdhestvensky, Howard Shelley, Marcello Viotti, Christoph von Dohnanyi and Mark Wigglesworth. Commercial recordings include Hobson PETER GRIMES with Glyndebourne Festival Opera on the Glyndebourne label, Casadesus Symphony No. 7 ‘Israël’ with the Northern Sinfonia on Chandos, First Nazarene SALOME with the Philharmonia Orchestra on Chandos, 2 Soldat SALOME with the Royal Opera House Covent Garden on Decca DVD, Elder McLean SUSANNAH with Opéra National de Lyon on Virgin Classics, the Grammy-winning recording Puccini Experience with Angela Gheorghiu, Johan Botha and Anthony Michaels-Moore with the Royal Opera House Covent Garden on Conifer and The Nightwatchman Die Meistersinger von Nurnberg with the Royal Opera House on their Heritage Series.